Minstrelsy, killer trees and teenage angst in Suffolk. Halesworth is a small Suffolk market town, just a few miles upstream from Southwold, home of Latitude Festival. It’s also the home of the HighTide theatre festival, now in its seventh year, which might not attract such a big crowd, but still has an impressive reputation for airing new writing. Under the direction of Steven Atkinson, the festival organisers read a thousand odd unsolicited scripts a year from round the world, and develop work directly with writers, to present an ever growing programme of theatre and performance. The festival’s main hub is The Cut arts centre, a converted Victorian maltings factory fermented up into a theatre with a sizeable main house and studio. Its joined by the 18th century Rifle Hall, which has been used for performances by itinerant theatre groups for hundreds of years, and the old Printworks, a short stroll up the town’s main street, The Thoroughfare. I was lulled into a sense of calm and serenity by the clustered tea shops, old pubs and impressive window display of knitted animals on offer, which was firmly and conclusively shattered by the cacophonous dawn chorus of new writing on offer. 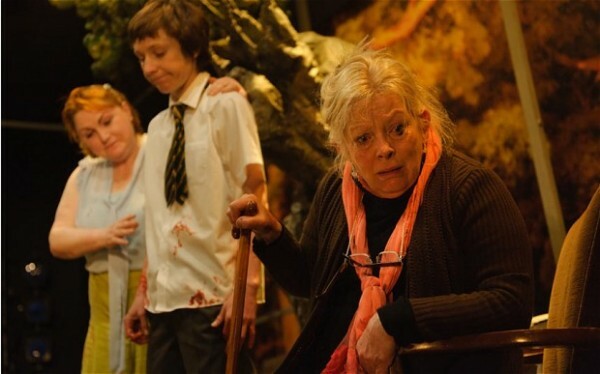 Declan Greene’s play Moth is a sweary, flashy, and often baffling take on the misery of school life in Year 10. Two vulnerable, fluttering teenagers shelter under an immense cross-shaped construction of steel and light bulbs, designed by James Cotterill to look like everything a child might hope Laserquest would be, before being confronted by the dusty reality of MDF and chipped neon paint. Sebastian (Jordan Mifsud) takes refuge from smelly awkwardness and bullies in a world of comic books and fantasy, the lights above him flashing out the exhilaration he can only find in his imaginative quest, led by a moth in a jar that becomes something between a spirit guide and a Svengali to him. Claryssa (Stacey Gregg) is his unlikely helpmeet, her motivations less obvious – she seems driven mainly by anger, finding outlets in tippexing her Dr Martens and letting off creative strings of obscenities. Ideas are let loose at a pace as frenetic as the adrenaline surges and hormonal rushes that hold the play’s teenage characters captive, leaving the audience trapped in a breakneck narrative that suffers from thinly sketched characters, and an impenetrable plot. Pastoral is the ‘first play’ by Thomas Eccleshare of Dancing Brick (read more on Eccleshare and ‘new’ writing here). It was the winner of the Verity Bargate award back in 2011 and the time lapse between then and its opening in Halesworth should have left plenty of time for workshopping and editing, but instead the work feels thorny and unfinished, a muddle of a thing. Moll is a cantankerous old women, introduced via a poisonous diatribe about “the fat” which raises awkward laughter, but doesn’t provide much clue as to what the play might be about or even relate to it at all. The atmosphere is a little bit like that of a Doctor Who story from the 70s where Tom Baker got stuck in the pub and the other characters had to muddle through as best they could. Moll and two young men of mysterious relationship to her are facing some kind of non-specific environmental crisis – their feeble escape plans fall through, and they are left besieged by a rather neutered version of nature in all its fury. Day of the Triffids this isn’t. Its not clear exactly what threat the encroaching trees pose – the branches that push through the flat’s floor are largely ignored – while the references to foxes, voles and hedgehogs running wild outside are hardly calculated to terrify. The design doesn’t help the atmosphere either: bright lighting and a cobbled together aesthetic do nothing to establish where we are, or what’s going on. The piece’s weak characterisation, plot and often tastelessly provocative elements might have been forgiveable if there was a serious environmental or social point to be made. As it is, we’re left with a comedy without the jokes, lightened only by the odd flash of shambolic charm. Brandon Jacobs-Jenkins’ Neighbors is a more exciting proposition. The play was first staged in 2010 at New York’s Pulic Theater and offers an insider’s view of racial politics that richocets between uproarious, shocking Vaudeville camp and nuanced family drama. Richard, Jean and their biracial daughter Melody’s story is literally foregrounded in a set that presses their kitchen right up in front of a tawdry proscenium arch. Behind them, their new neighbours the Crow family corrall all the racial stereotypes they can find into a musical revue, complete with black-face make-up and grass skirts, and intervening into the tense racial dynamics beneath Richard and Jean’s marriage. Ploughing into the long thorny grass of a supposedly “post-race” society with all the caution of a combine harvester, the play works because of Branden Jacobs-Jenkins’s constant alertness – he never lets things run away from him, and is always ready to shift dynamics, to make things complicated. Parts of the play were more shocking than anything I’ve seen on stage, but always justified, thanks to the play’s willingness to poke fun and confront an audience a million miles from black American suburbia. The three plays previewed here are getting a good country airing ready for transfer to London – to Soho and the Bush – and to the Nuffield Theatre, Southampton. The festival also includes a performance by Thom Tuck, who won my heart at the Edinburgh Fringe with his musical takes on straight-to-DVD Disney sequels, interspersed with sorry tales of heartbreak, and he will be reprising the show on Saturday 11th May. There’s also a late night jazz session, the intriguing sounding Hackney Colliery Band, a couple of book readings, and nice collection of secondhand bookshops to while away any downtime. The HighTide Festival runs from 2nd-12th May in Halesworth, Suffolk.